Do you know what a mouthbow is? It’s believed to be the oldest stringed instrument in the world. It’s found in many indigenous cultures around the world. A French cave painting about 15,000 years old shows an individual dancing toward several buffalo while playing something that looks like a mouthbow. Mouthbows probably derived from hunting bows. Someone discovered they were good for more than hunting, made noise, and an artistic spark was ignited in the music lover’s soul. In the US, the mouthbow may have been introduced by African slaves. Today it’s primarily found in Appalachia. The usual way to make the bow sound is to pluck the string, although sometimes a subsidiary bow is used to scrape the string, much as on a violin although some sound when struck with a thin stick. Unlike string instruments used in classical music, however, they do not have a built-in resonator, although resonators may be made to work with the bow in a number of ways. The most usual type of resonator consists of a gourd attached to the back of the string bearer. The bow may also be stood in a pit or gourd on the ground, or one end of it may be partially placed in the mouth. This last method allows the size of the resonator to be varied as the instrument is played, thus allowing a melody to be heard consisting of the notes resonating in the player’s mouth. As well as these various forms of resonators, the bow is frequently played without a resonator at all. The musical bow is generally played on its own, as a solo instrument, although it is sometimes played, amplified, as part of an ensemble in Appalachian old-time music. Probably the most well-known artist to use the mouthbow is Buffy Sainte-Marie, an Academy Award winning Canadian First Nations musician, composer, artist, educator and social activist, born on the Cree Indian Reserve in Saskatchewan. Buffy has created a website about the mouthbow including where to purchase one. However, my favorite mouthbow site is Buffy’s blog where you can see a video of her performing using the mouthbow and singing Cripple Creek. Want to make one? Here’s a link to construct an Appalachian mouthbow and some tips on care and feeding. This entry was posted in Cree. Bookmark the permalink. Spectacular! I would think that striking the string while in the mouth would really vibrate. I know this is why I never put a juice harp in my mouth. There is likely a method to prevent that. Quite interesting nonetheless. Music can be made from so many primitive sources! 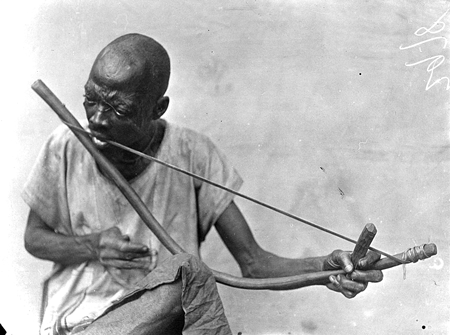 the Chumash tribe of Southern California played mouth bows.There is a photo taken of Fernando Librado playing one taken in the 1920s in Santa Barbara.